Paddling in a cave, spinning on the rapids, skimming a glacier. Arjun Ramnath subscribes to New Zealand’s adventure tourism and discovers that there’s nothing like a good thrill to refresh the system! Between the about 12,000 feet Mt. Cook and Mt. 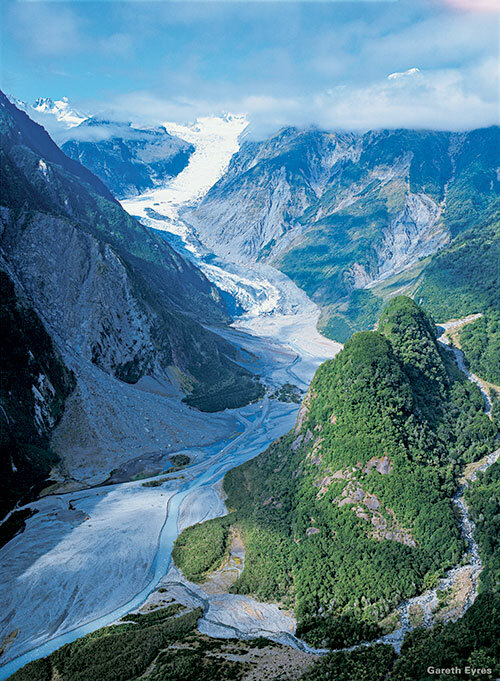 Tasman, two of the country’s tallest mountains, lies the Fox Glacier, a long tongue of ice that slopes down towards lush temperate forests some 200 metres above sea level. So that makes Fox among the very few places in the world where the sea, dense forests and mountains are accommodated in one eyeful. Just gazing at the views is a good way to spend time at the Fox Glacier Village, but what companies like Fox Glacier Guiding do is get you up close with the glacier. Among their many guided walks, from a half-day programme to an ice-climbing experience, is the Heli Hike, where a chopper drops a group outfitted in proper gear on the lower reaches of the glacier. What follows is stuff you would have never experienced before – unless you’ve already been to Fox that is – as your guide leads you around a spectacular, living landscape. You’ll slip-slide through transparent caves with roofs of ice, gingerly avoid minor crevasses, and walk around mesmerising natural formations carved by the wind. It is an experience both calming and exhilarating at the same time, and what’s more, it’s also a great calorie-burner. The highway, which runs from Fox Glacier passes through quaint, absolutely unpopulated towns, like Hokitika, Punakaiki and Charleston, and opens up to spectacular panoramas. Sit back and watch in awe as your car window frames, among other sights, a brooding Tasman Sea, the wind-battered, desolate Cape Foulwind with its colony of seals and shepherds on quad-bikes on misty evenings. If you ever drive by little Charleston, en route to Christchurch, you’ll think nothing much would happen here. After all, it’s a one-horse town with about 500 people, there’s just one good restaurant and, while it’s got the Tasman Sea, it’s a pretty quiet place. Then, you meet Ray Moroney. 50-year-old Moroney, a former school teacher, has designed capsules of activity in the rainforests (the Paparoa National Park) and around the limestone cliffs and caves that surround the town that are cool to the point of absolute zero. What does Moroney do? He has rainforests, limestone caves and a river called the Nile that flows through the forest, right? Now he has built a tiny train called the Cecil and a railway line, which takes you into the rainforest. After making you wear what could be the strangest get-up you’ve ever worn in your life – a wet suit, a caving helmet with LED lights and waterproof rubber boots – he hands you a rubber tube. You walk until you are at the upper level of a 25,000-year-old limestone cave system and then walk step in. Inside, it is pitch-dark and then you turn on your LED light. Around you, at regular intervals are stalactites, dripping from the roof of the caves, and stalagmites rising from the ground, in the most erratically beautiful formations. Moroney leads you around the cave system and down it; as you drop levels, you hear the gentle gush of the river outside. All of a sudden, he thwacks his rubber tube on the ground and parts of the roof over the cave light up! The ‘lit’ portions are glow-worm colonies that inhabit the roof and, according to Moroney, the glow-worms mistake the vibration caused by the rubber tube hitting the ground as the buzz of flies or other winged insects. They glow to attract the winged critters into their sticky homes. You gaze at the ‘lit’ colonies which seem like stars on an inky black night and follow Moroney around as he searches for underground water channels inside the system, that seek the river outside. Once he finds one, you throw the rubber tube into the leisurely flowing channel, jump on it and paddle with your hands until you reach the opening of the cave system and then, float onto the river! The Kiwis call this Jet Boat therapy and it’s supposed to be good for your health. 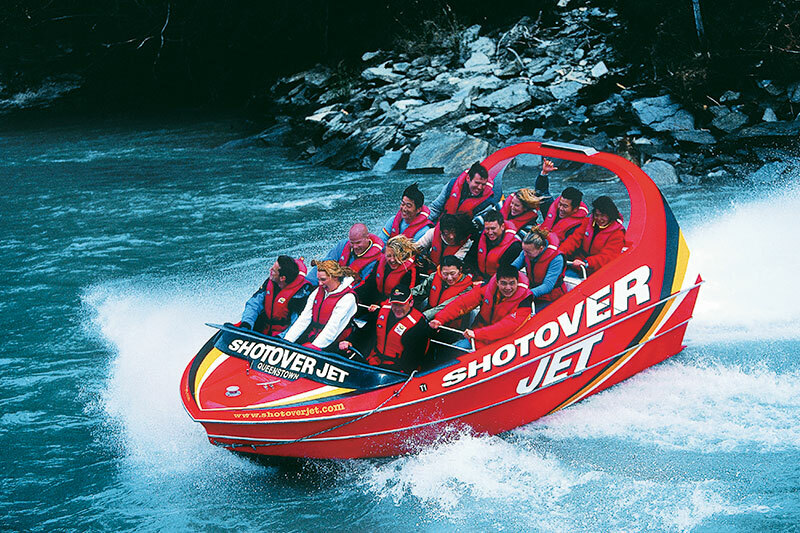 This experience involves a blisteringly fast boat, incredibly skilled jet pilots, the canyons of the Shotover River and 14 passengers with petrified grins. And it doesn’t stop with the boat skimming the waters in the narrow canyon at a spectacular pace, swinging by rocky outcrops and navigating between massive boulders. There’s something called the 360 degree spin; an outrageous stunt that makes you grip the hand rail tighter, gets anxiety levels to spike and then, as the Shotover’s pilot finishes spinning the boat around its own length, engenders a foolishly relieved smile to line your face. Wondering what the blabber about therapy was? According to the folks at Shotover, there’s nothing like a good thrill to liven up your system and wake up dormant biochemical pathways that refresh, relieve stress and heal. Hokianga, which lies on the western coast of Northland – two islands form New Zealand, Northland and South Island – is a fabulous place, with sandy coves that offer stirring views of the Tasman Sea. But what yanks its appeal sky high, is the Waipoua; part of a 22,000 acre sub-tropical forest that according to scientists is just what the world was like some 150 million years ago. And the Waipoua is indeed dark, dense, and wet green and crammed with life – a variety of fern and grass and magnificent kauri (white pine) trees. And the grandest of all kauri trees is Tane Mahuta or the ‘Lord of the Forest’. 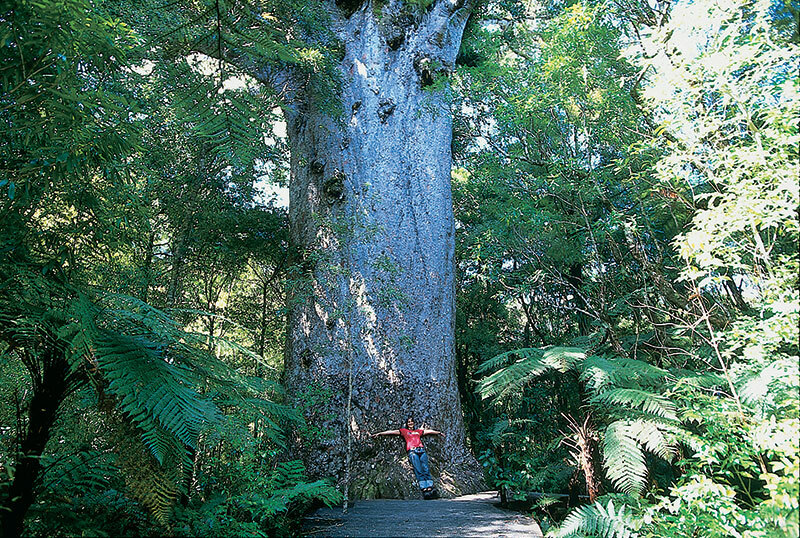 51 metres tall and with a circumference of 13.5 centimetres; the over 2000-year old tree has been there twice as long as the Maoris and is the object of their veneration. Standing before a tree as old as Christianity in an ancient forest, is as spiritual an experience as a night in the desert or a view of a snow-capped mountain. Bottom line… if you go to Hokianga, don’t miss Waipoua.